Heckler & Koch SP5K Pistol Arrives! You are here: Home / Firearms / Heckler & Koch SP5K Pistol Arrives! 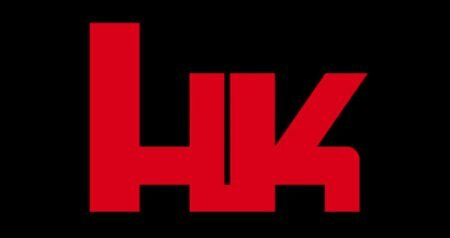 Heckler & Koch has announced their new SP5K pistol will officially be introduced to America at the NRA Annual Meeting and Exposition in Louisville, Kentucky this weekend. 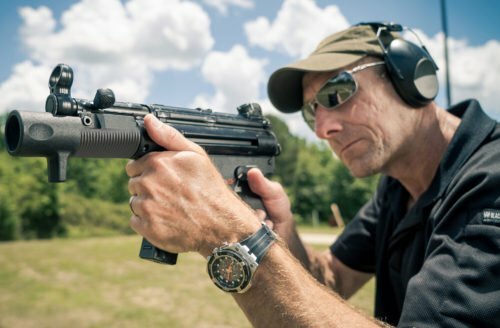 The SP5K is a semi-automatic pistol based on the company’s iconic MP5K sub-machine gun. This announcement has garnered a lot of attention in both law enforcement and civilian circles. Our friends at The Firearm Blog were able to get their hands on one early for a review. Designed to be a “sporting pistol” the SP5K makes no doubt about its origins, in fact it was designed to do just that. The new SP5K returns the famous HK roller delayed blowback operating system to a commercial product. There is no doubt this will be a very popular product, despite its very high price. The HK SP5K brings a whole new look to the MP-5. The roller delayed blowback operating system is well-known for its accuracy and reliability. Originally developed on the G3 rifle, it has been used on many of Heckler & Koch’s most memorable firearms of the last 60 years. I remember fondly my time being assigned one of our SWAT Team’s MP-5 sub-machine guns with the full-auto Navy trigger group. The operating system gave the MP-5 a remarkably unique feel when firing, and I can absolutely attest to its accuracy and reliability. The SP5K pistol captures the essence of the MP-5. THe SP5K will come with a fluted chamber allowing expelled gases to “lubricate” and help expel spent cartridge casings. Like a good HK firearm, the SP5K will have an ambidextrous safety selector, with the classic pictograph emblems representing fire and safe. A short finger guard extends downward on the front of the handguard (actually a part of the muzzle device) to protect and keep the shooter’s support hand in the proper location during less than ideal shooting environments. 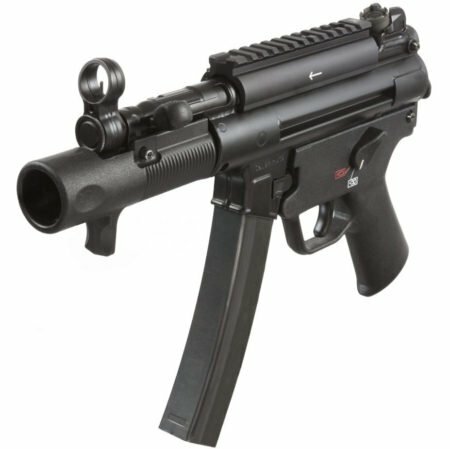 The HK SP5K will aim like the MP5, just minus the buttstock for support. Note the finger guard at the bottom of the muzzle device. How do you get this guys job? One very noticeable difference in the SP5K from the MP-5 is the magazine release. On the SP5K the magazine release takes the form of a button on the side of the lower receiver just behind the magazine well. This is not as favorable as the easily reached lever on the MP-5 located at the bottom of the lower receiver, behind the magazine. However, this is a similar location as the AR-15, and may very well be easily transitioned to in training. The HK SP5K pistol comes equipped with a special ergonomic handguard to protect the shooter’s supporting hand and enables a stable and comfortable grip. HK includes a bungee cord sling, and makes shooting an SP5K easy. Not that an HK product based upon the MP-5 could be difficult! The whole intent and purpose of the SP5K is to mimic the feel of the MP-5, while opening up the market to more shooters by making it a semi-auto pistol. The SP5K duplicates the quality and fine details of the MP5, including its precision machined components. 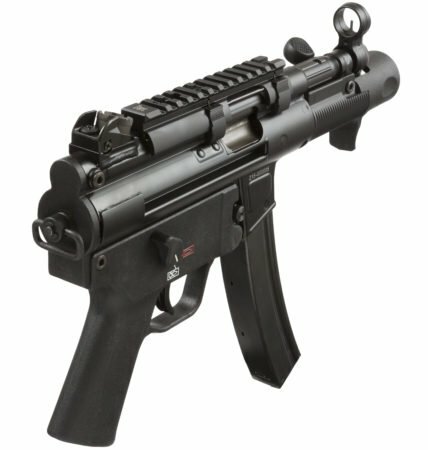 The SP5K is made with the same cold-hammer forged barrel used on the MP5K, a barrel that easily ensured users a service life of tens of thousands of rounds. I know our MP-5’s left our service with well over 20,000 rounds each and they were still firing fine. The SP5K is manufactured completely in Heckler & Koch’s Oberndorf factory in southwest Germany. The SP5K comes with a top Picatinny rail, unique muzzle device and foregrip, molded handguard, diopter sights and a bungee sling. The proven roller delayed blowback system packaged in a large pistol frame provides the SP5K’s inherent accuracy. The door is wide open for government and civilian uses alike. This could be an excellent choice for target shooting, an ideal household security firearm, a return as a SWAT entry gun, and even as a concealed firearm on protective details. HK thought ahead when planning the SP5K, and a wide variety of accessories can be added to increase its functionality. A Picatinny rail scope mount is attached to the upper receiver and allows optional sights to be easily mounted. The SP5K also comes in a custom-fitted, lockable, high-quality carrying case. 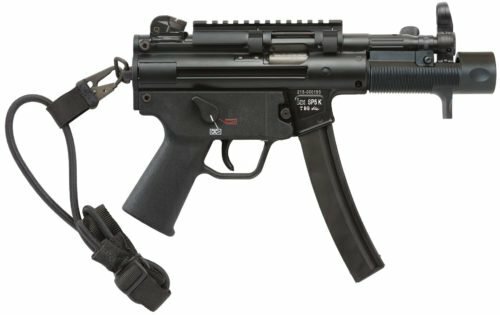 Covered by Heckler & Koch’s limited lifetime warranty, the HK SP5K is a faithful rendering of the iconic MP5K as a semi-automatic pistol. Projected availability is July 2016 with the only drawback being a MSRP of $2699. The SP5K pistol comes with a Picatinny top rail, molded handguard, bungee sling, and a special muzzle device and foregrip. Classic HK Slam Forward Charging Handle. Optional reflex sights are easily attached to the Picatinny rail, for even quicker target sighting. MSRP for Magazines: $80.00 for both 10 and 30-round. The SP5K has the classic HK MP-5 slap-forward charging handle (though with shorter travel distance). Whenever I think about my time behind my HK MP-5 I get a giddy smile on my face. From amazingly precise single shots, to short bursts, and full auto fun, the MP-5 is in its own league. Durable, accurate, easy to maintain, and just a fun, compact weapon to shoot and carry. 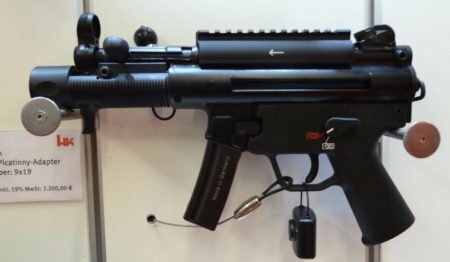 Not Heckler & Koch introduces their SP5K pistol, that appears to be a sized-down MP-5 without the buttstock. All the features are there from the iconic grip, and safety lever, to the diopter sights and smack forward charging bolt. I’m sure there will be many who will save up to own one of these fun guns. 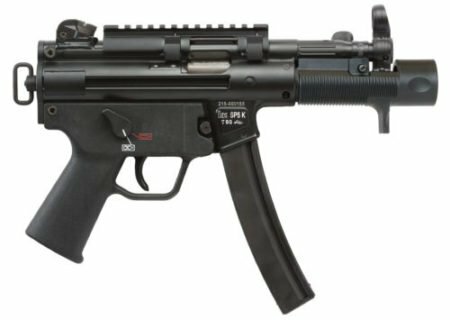 The new HK SP5K pistol, and its obvious similarities to the MP-5. As far as law enforcement work, most agencies have moved away from MP-5’s and are now carrying AR-15’s. With the proliferation of AR-15’s, including short-barreled rifles (SBR) as short as 9.5″ and 10″, the AR-15 has made a strong name for itself as an entry weapon and compact rifle. Though the 9mm has shown some over-penetration problems, the cartridge as a whole has advanced dramatically in the last 10 years that saw the movement away from MP-5’s. There are many more viable ammunition choices today that could once again make the SP5K a viable entry weapon option. Typically officers carrying a long-gun take full advantage of the stock for great support in aiming and accuracy. However, the small (though large for a pistol) size of the SP5K not only provides a considerably more compact carry package, the use of the included foregrip or a vertical grip option, could easily be wielded with precision considering the relatively light recoil of the 9x19mm ammunition it will be firing. I doubt there will be a rush back to Heckler & Koch for the new SP5K in law enforcement, though I could see private security companies dealing with protective details jumping all over this new pistol. The one HUGE drawback I see is the incredibly stifling $2699 price tag. It will be hard for cash-strapped agencies or individual officers to justify one “pistol” purchase, when they could pick up three respectable AR-15’s for that price. Brethren Armament, makes a better product at a more reasonable 1800 bucks or so for their factory “pistol”. Plus it does not have the upper receiver modified to prevent the use of full auto components. Quinn has made his guns select fire for agencies etc. upon request. His guns have the three lug adapter and are compatible with all MP5 accessories. Brethren guns do have the welded shelf to be compliant with ATF regs, otherwise you could just slap a select fire lower on there. The Brethren product has the original paddle mag release. This HK pistol doesn’t look like it has the paddle release. Other good things about the Brethren guns is that they are 100% made here in USA. Also the company is owned by two Vet brothers. Quinn McIntosh is the brother that runs the business side of the operation, and he is just the nicest guy you will ever work with. He is also developing the roller locked platform further and making improvements. He is soon to release an MP5 lower that accepts AR trigger packs. His guns come with integrated picatinny rails on the receivers, no cheezy mount to mess with. Also he is a true custom shop, he does just about anything you want, his stuff is all hand built. He has nearly all of the variants available, reverse stretches, he even does a 10mm K. I could not recommend them more, best customer service I have ever experienced bar none. Outstanding report Dark Knight, and much appreciated. The Brethren Armament firearms appear to be top notch products, and for much less than their German counterparts. Being a Vet owned business makes them even more attractive. Another expensive range toy brought to you by HK. Yawn.